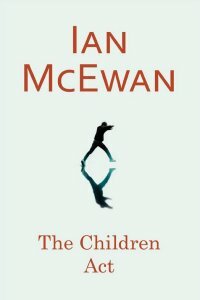 It might seem strange that I’m reviewing a novel on the Fathers Matter blog, but when I heard that Ian McEwan had written a new novel entitled The Children Act I was intrigued. Since I come from a family law background and write legal handbooks pertaining to issues arising out of The Children Act I was interested in what the subject matter for his plot would be and how he would build a storyline around it. The author confirms in the Acknowledgements that his story “has its origins” in two cases presided over by Sir Alan Ward. He has indeed based his story on several harrowing cases and woven his plot around them. In the book the 17 year old Adam is a Jehovah’s Witness suffering from leukemia and refusing a blood transfusion which would save his life. Fiona Maye is the High Court Judge who must decide whether to rule in favour of the hospital and grant the medics permission to transfuse him. Her dilemma is that once he reaches 18 he will have the legal right to refuse a transfusion and the court will be unable to intervene. But a decision cannot wait if Adam is to have any chance of survival. After due consideration of all the legal issues Fiona grants permission to the hospital. I found the protagonist Fiona Maye a rather tortured character in many respects but I didn’t particularly warm to her. At the beginning of the novel her marriage to Jack has hit rock bottom. She has been preoccupied with her legal work and has dealt with a difficult case about the separation of conjoined twins (this is another case based on a decision of Sir Alan Ward in 2000). Jack is feeling neglected and thinking about having an affair. Fiona comes across as cold, detached and very matter of fact and she projects that emotion or lack of it onto Jack. She acknowledges that she was ambitious and her legal career took priority over having a family so when she refers to her childlessness I felt it is with a touch of sadness (as the opportunity was there) but not regret (as she consciously chose not to have children). I wasn’t quite sure what to make of the relationship with Adam and what her feelings were for him exactly. Does she think of him as the child she never had or does she falls in love with him? And is any of this actually credible? Did I enjoy this book? I’m not sure. There are elements of the book I enjoyed. Ian McEwan clearly has an eye for detail. He has also tackled some complex and controversial issues, but personally I didn’t find the book an easy read, and not simply due to the subject matter. The first chapter is 40 pages (the total book is only 213 pages) and is disjointed because there are huge passages of narrative interspersed with little dialogue which I felt inhibited the flow. In the subsequent chapters where there were sections of increased dialogue the book picked up pace and became a faster read. But overall I did not find the plot convincing and was slightly disappointed by the ending. Others may disagree but that’s why we’re all entitled to an opinion! To read my review of this book on Amazon or to read more about the author and/or to buy this book please click here.